Report has it that there has been a prolonged bout of shooting from Giwa and Maimalari barracks in Maiduguri. 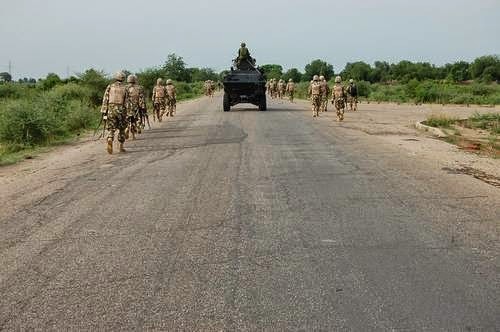 According to Sahara Reporters, some of the residents of Maiduguri said they were in panic after hearing sustained shooting that emanated from the two military barracks. The residents who were already scared following a statement by Governor Kashim Shettima that the sect was aiming to invade and seize Maiduguri following their military successes in Adamawa State, said they were startled awake by sounds of gunshots and rocket-propelled grenades fired by Nigerian troops. The shooting was confirmed by a military source but he denied it had anything to do with attacks by the Islamist insurgency group, Boko Haram. He explained that the shooting was only meant to scare away the insurgents and discourage them from contemplating an attack on Maiduguri. “Our troops are more than capable of defending Maiduguri,” the military source said. He therefore advised the residents to go about their business without fear. Some days back, the leader of Boko Haram, Abubakar Shekau, denied the alleged ceasefire agreement with the Federal Government. The Boko Haram sect has carried out various attacks in the past days. They recently seized the town of Mubi, bombed a bus station in Gombe, suicide bombed a procession in Potiskum, and broke into a federal prison to free prisoners in Kogi State.